1. Museum of Krapina Neanderthals - New Museum of Krapina Neanderthals is located near the world famous findings of Krapina Neanderthals Hušnjakovo and first paleontological monument of nature in Croatia. The finding is one of the wealthiest Paleolithic habitat of Neanderthal man in Croatia and Europe. 3. Špancirfest -Festival of good emotions - Špancirfest is one of the most popular festival event in Croatia. In the ten days of the festival is held varied program, where everyone can find something for himself (concerts of world music, rock, blues, folk, children s programs and performances, theatrical comedy for adults, and performances by street performers, entertainers and musicians) and the festival is accompanied by a excellent gastronomic offer. Central Croatia is largest tourist region in Croatia. It offers wide variety of touristic offer, so it points more types of tourism such as; hunting, business, congress, and rural tourism. Varazdin: Varazdin is located along the banks of the Drava river in northwestern Croatia. 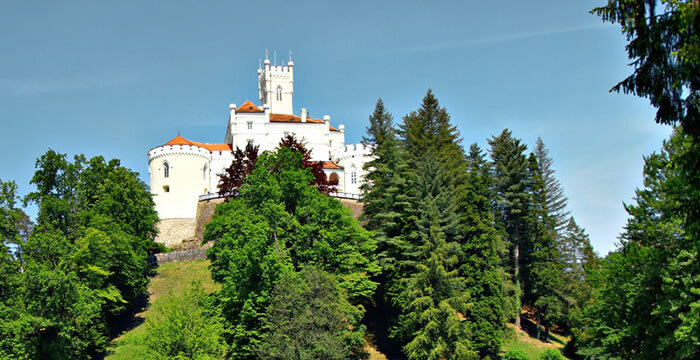 Varazdin is a city rich of history and was first mentioned in writing in 1181. year. City of Varaždin has nearly 50,000 inhabitants today and is one of the most developed cities in the Republic of Croatia. It is an important cultural and social center and is widely known as a city of Baroque. Samobor: Samobor is the most attractive place in the region of Zagreb and the cradle of the Croatian mountain climbing. In Samobor of historical sites there are King Tomislav Square, Samobor Old Town, Livadic Manor House from 17th century, Samobor Museum. Events such as Carnival of Samobor and classic car rally are just a part of the rich tourism offer of Samobor and among the gourmets are particularly famous "kremsnite" cakes. Cakovec: From a humble medieval Oppidum arising near the fort, Cakovec has grown today into a modern European city of the Central Croatian. For tourists along with the historic old town, Zrinskih Castle and Franciscan Monastery offers excellent gastronomic offer, sports and entertainment activities, rich nightlife and numerous events throughout the year, such as "Carnival of Medimurje" and fair in the city center. Velika Gorica: Velika Gorica is located 16 km south of Zagreb. It is the center of Turopolje and the city of opportunities, young people, urban core, the great historical and cultural heritages, ecologically preserved environment. In Velika Gorica is located valuable archaeological finds, historic sites, such as wooden chapels and noble manors, the old square in front of the Town Hall and religious monuments are an important part of tourism offer. Krapina: Krapina is a small town that adorns a rich heritage where are prehistoric people left their inerasable mark. New Museum of Krapina Neanderthals is the most modern and the most sophisticated museum in the world and it is must-see tourist destination of Central Croatian. A number of cultural events take place throughout the entire year. Koprivnica: The center of town Koprivnica is founded on the location of the former Koprivnica fort, today at the place of the fort is a beautiful park with a pavilion. In Koprivnici adventurers can enjoy in the traditional hunting, fishing, hiking or cycling, while those who are less prone to adventures have a great selection of restaurants that nourish Podravina kitchen. Karlovac: The city of Karlovac is situated in the heart of the Croatian at the confluence of four rivers. It is attractive destination for vacation and entertainment. Karlovac is a example based of the leading architectural ideas of his time: Renaissance, geometrically correct figure of a six-pointed stars. Beautiful view on the Karlovac is provided from the Old Town of Dubovac. From historical sites there are Botanical Garden, The main town square and Miljokaz. Sisak: City of Sisak is important since the Roman era, and to the north there are the spa of Varaždin and town Cakovec.